If you’ve ever gone to a state fair as a child or as an adult, you will know that the smell of deep-fried food is very alluring. There is something very satisfying with eating food that has been dipped in batter and fried until it has become crispy and golden on the outside. It may be considered as unhealthy by many health buffs, but the demand for fried food and the number of people who enjoy them is evidence enough that fried food is still considered as one of the best comfort foods. Everything from Snickers bars to butter has been deep-fried and enjoyed by people, but classic fries and chicken tenders still make a good staple at home. Buying fried food from restaurants can be very unhealthy because there can be a long list of additives you don’t know about. Even if deep-fried food is still considered unhealthy, making your own with the help of a deep fryer like the Cuisinart CDF-200 Deep Fryer is still a healthier choice compared to ordering out. If you have fried food cravings but prefer to have an option that is a little healthier, then this review of the Cuisinart CDF-200 Deep Fryer will be very useful to you. Fried food is universally loved by people. This has been tested and proven, which is why there are so many deep fryers available on the market. The Cuisinart CDF-200 Deep Fryer is just one of those top choices for deep fryers to have at home. This deep fryer does everything that it promises and delivers high-quality fried food consistently. While most deep fryers have a control for the temperature or a preset thermostat what they lack is a display that shows the current oil temperature. This can be a hassle, especially for new users. This is why this deep fryer comes with a reliable display. It makes it easy to monitor the food you are frying to ensure it is not over or under fried. The immersion-style heating element is also a big plus when it comes to consistency. Those who want to make perfectly fried food will find this feature very helpful. It helps the unit maintain a steady temperature and also allows it to recover quickly from heat loss. This is great in making sure that the food you are frying is crisp on the outside, but still juicy and well-cooked on the inside, which translates to perfectly fried food. Cuisinart is a company known for manufacturing high-quality and reliable kitchen gadgets, and the Cuisinart CDF-200 Deep Fryer is one of those gadgets. It is well designed and produces enough fried food for a large family without using too much oil. It heats up oil quickly, in five to ten minutes you will be ready to fry up some goodness, and it comes out evenly cooked. When you’re done using the deep fryer, cleaning is a breeze as well. The basket, oil container, and lid are all dishwasher safe, so you won’t have to worry about spending the night scrubbing oil off your fryer. 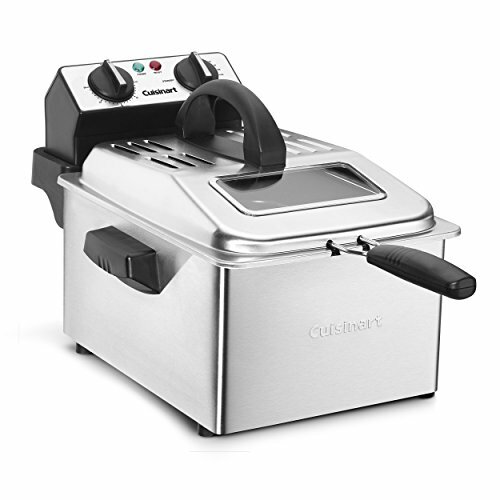 Although the Cuisinart CDF-200 Deep Fryer is great for deep frying in bulk, it also consumes a lot of oil in the process. This makes it a hassle, especially for those who do not like to reuse their food to maintain freshness. Due to its large oil requirement, it would only be a good idea to use this deep fryer when you are frying large amounts of food on a regular basis. If not, there are other deep fryers available. The Cuisinart CDF-200 Deep Fryer is also an expensive deep fryer. This is understandable as it is a well-known brand that produces high-quality kitchenware. If you are not planning to use your deep fryer regularly it may not be worth it to purchase a deep fryer this big. Other users have also struggled with keeping the correct frying temperature with this deep fryer. As a tip, do not fry frozen food as it will lower the oil temperature and will not give optimum results. As a deep fryer that can fry enough food for a large family, the Cuisinart CDF-200 Deep Fryer is a good investment. Those who enjoy the crispiness of a properly fried piece of food will find that this deep fryer will make a good addition to their kitchens. If you’re looking for a big deep fryer and you are willing to spend a little extra, this is a great option to consider. How Long To Deep Fry Pork Chops? How Long To Fry fish? Some recommended products may use affiliate links. TopKitchenDepot.com is a participant in the Amazon Services LLC Associates Program, an affiliate advertising program designed to provide a means for sites to earn advertising fees by advertising and linking to Amazon.com. Amazon and the Amazon logo are trademarks of Amazon.com, Inc or its affiliates. Copyright 2017 Top Kitchen Depot | All Rights Reserved.